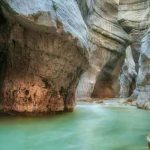 As you may already know, Iran is full of amazing natural wonders about some of which we have written before, like great canyons in Iran. But today, Iran Destination, Iran travel agent, is going to introduce you some of the popular and beautiful lakes of Iran. Just follow this Iran Travel Agency to get all you need about Iran. And then you can travel to Iran with peace of mind, through any of our Iran tour packages or can just tailor made a tour. But what are the famous lakes in Iran any nature lover likes to visit? Read below. What is the world’s largest lake? Yeah, that’s the Caspian Sea in north of Iran. This large lake is bound by Iran, Kazakhstan, Russia, Azerbaijan and Turkmenistan. The finest caviar of the world comes from the sturgeon living in the Caspian Sea. Many Iranian people visit north of Iran and the Caspian Sea beaches during Iranian holidays. This is one of the best destinations for nature lovers. 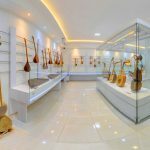 Although some of the cities and sites along the Caspian Sea get so crowded during the holidays, there are still some unknown wonders along this largest lake in the world. Iran Destination, Iran travel agent, can arrange you an Iran tour including the Caspian Sea. Many people from around the world have heard of Lake Urmia in the northwest of Iran. The sad fact is that Lake Urmia has been once the biggest lake in the Middle East. This lake has 102 islands and unfortunately has shrunken, but it is still attractive and astonishing. The interesting point about this lake is that the color changes to red at times. The main color of this salt lake in Urmia is blue; but due to algae and bacteria increase and also salt concentration increase, the color gets a red hue when the water level declines specially during hot seasons. There is another lake in Iran with the same characteristic, called Maharloo Lake, about which we will talk later below. One of other natural wonders in Iran is Gahar Lake and the interesting point is that not all Iranians are aware of that and not all people visit this natural beauty. So contrary to the Caspian Sea which gets crowded time to time, Gahar Lake is a good quiet destination for those who like to get relaxed in pure nature. Gahar is located in Lorestan Province, and it is actually divided into two parts: upper and lower Gahar, which are only 100 meters apart from each other. This is called a jewel in Zagros Mountains, so you’d better not miss it if you travel to Iran. In case you are interested in any of the lakes of Iran, just contact Iran Destination, Iran travel agency, and ask us for an Iran tour. You’ll enjoy the most out of your trip. A couple of hours away from Tehran, you’ll be surprised by a lake in the middle of desert! The salt lake, or what is called Namak Lake in Persian, is located 62 kilometers east of Qom. Many professional photographers visit this place during days and nights to get unique shots. The surface area here is about 1800 square kilometers, but only 1 square kilometer is covered by water. So you may have a unique experience of walking on thick layers of white salt while trying to reach the water. Also during nights, you can enjoy the spectacular view of the sky full of stars. Another natural attraction in north of Iran is Anzali pond located in Gilan province. Anzali lake is the biggest freshwater lake in Iran. This is one of the most romantic and fascinating places to visit in Iran, as it gets full of Caspian lotus flowers and also different kinds of birds flocking here and there. There are almost 78 different bird species in Anzali lagoon, attracting so many tourists to enjoy watching the flight of birds while riding on a boat. A lost paradise in western Iran, Zarivar Lake, is among attractive lakes of Iran, 1285 meters above the sea level. Zrebar is a Kurdish name (zer: sea , var or bar: lake in Kurdish). The interesting point is that no river supplies this lake, and the water is just provided by snow from the mountains around. There are lots of tree species around the lake, such as oaks, pears and almonds. Another attraction in this lake is the moving island in Zarivar, which many travelers and nature lovers try to visit during the year. In spring, ice covers the lake, but in other seasons of the year, it changes to a unique camping spot. You may have heard of the pink mosque in Shiraz. But in addition to the mosque, Shiraz has a pink lake as well! This is called Maharloo Lake by the locals and it is considered a salt lake, located 27 kms from Shiraz. What distinguishes Maharloo Lake from other lakes of Iran is its color. Similar to the Lake Urmia, the pink lake gets its reddish color from a special kind of algae and also because of high amount of potassium and other salts. You may have heard from those flying over Shiraz that a piece of pink land can be seen from the above; that is Maharloo Lake. But there are some other pink elements there as well: pink flamingos! So do not miss this beauty when you travel to Iran and specially Shiraz. Of course, you can see the pink color during the mid-summer, for the rest of the year, it has its normal color. Our Iran travel agency helps you discover any place you want. Just trust a local Iran travel agent. Valasht is one of other northern lakes of Iran, a suitable place for Tehrani people to spend their holidays and escape from the city and find peace. This lake contains 2 million square meters of water in an area of 24 hectares. Many springs around this lake feed it. This is one of the popular places for those who want to fish, as there are many types of tout in Valasht Lake; so you can see some people camping there and staying overnight to both enjoy the scenery and fish. To reach this lake, you have to pass Chalous road, one of popular roads in Iran and then you need to go up and down the hills by your car to get his astonishing lake with pure blue color. Iran Destination, a travel agency in Iran, helps you find this place and enjoy the most out of your trip. Here it is one of the other unknown natural beauties in Iran. 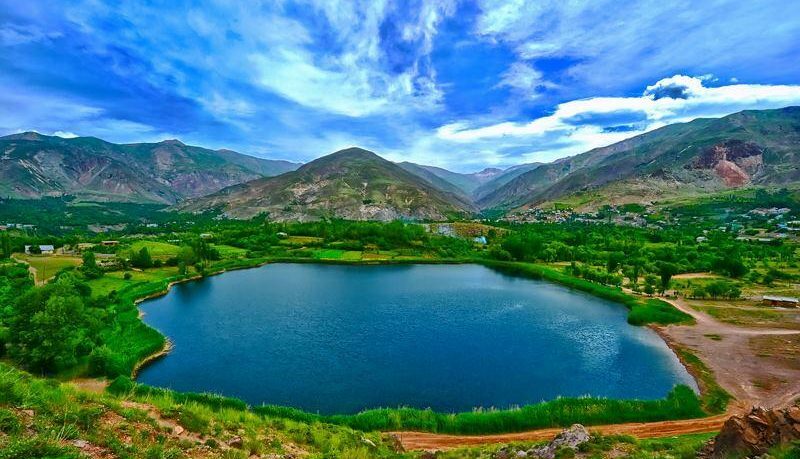 Ovan Lake, or sometimes called Evan Lake, is a small, but attractive, alpine lake in Alamut region of Alborz Mountains. This is located near Qazvin city and receives its water from the heavy seasonal rainfalls in wet seasons and also from the ever gushing springs around it. The deepest part of Ovan Lake is about 8 meters and extends over 70000 square meters. You can have amazing experiences in this lake, such as swimming, fishing and riding a boat during summer and watching migratory birds like swan, goose and duck during fall. 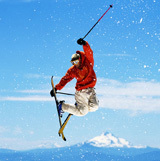 You can also enjoy winter sports like skiing and ice skating during winters on this lake. If you like to experience each of these, just do not hesitate to ask our Iran travel agency. 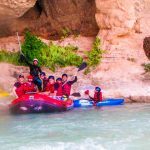 Having read this article, you now know about the main lakes of Iran which you can include in your trip to Iran. By this Iran travel agency, you’ll get the answer to the question: where is Iran?